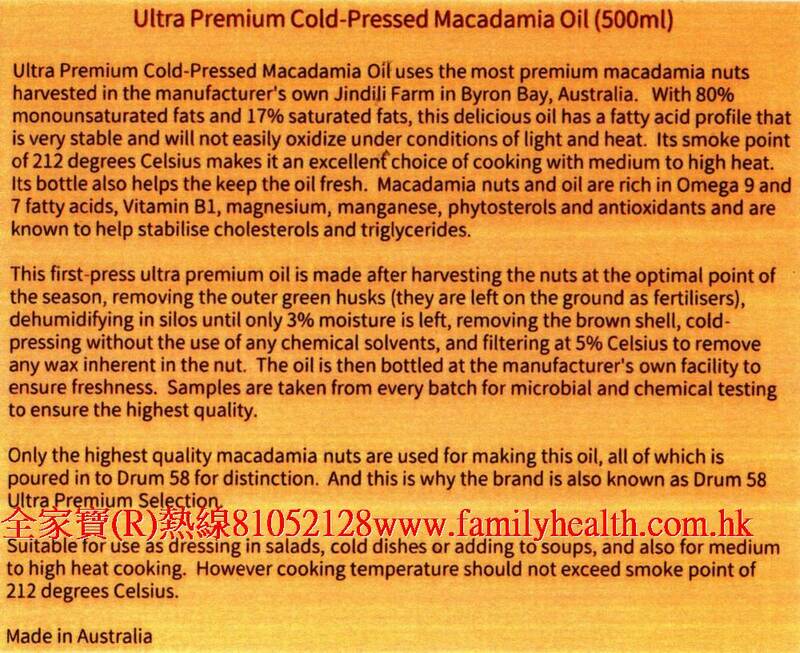 Ultra Premium Cold-Pressed Macadamia Oil uses the most premium macadamia nuts harvested in the manufacturer's own Jindili Farm in Byron Bay, Australia. With 80% monounsaturated fats and 17% saturated fats, this delicious oil has a fatty acid profile that is very stable and will not easily oxidize under conditions of light and heat. Its smoke point of 212 degrees Celsius makes it an excellent choice of cooking with medium to high heat. Its bottle also helps the keep the oil fresh. Macadamia nuts and oil are rich in Omega 9 and 7 fatty acids, Vitamin B1, magnesium, manganese, phytosterols and antioxidants and are known to help stabilise cholesterols and triglycerides. This first-press ultra premium oil is made after harvesting the nuts at the optimal point of the season, removing the outer green husks (they are left on the ground as fertilisers), dehumidifying in silos until only 3% moisture is left, removing the brown shell, cold-pressing without the use of any chemical solvents, and filtering at 5% Celsius to remove any wax inherent in the nut. The oil is then bottled at the manufacturer's own facility to ensure freshness. Samples are taken from every batch for microbial and chemical testing to ensure the highest quality. Macadamia oil is cholesterol free and the oil has a beautiful nutty flavour which is ideal in salad dressings as a nice alternative to olive oil. It has a high smoke point (210’C or 410’F) so is perfect for shallow frying and it can be used as a tasty alternative to other oil in baking. 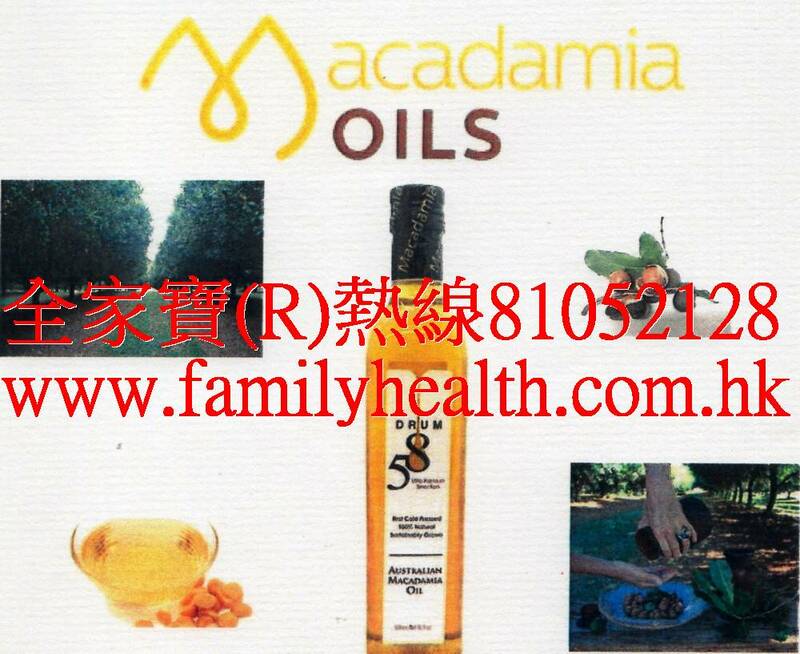 Macadamia oil is a very stable oil and has a long shelf life which is due to the low levels of unstable Omega 6 fatty acids and high levels of stable Omega 3 fatty acids such as Oleic Acid. 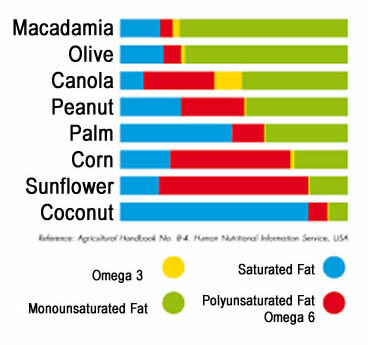 Macadamia oil is widely regarded as one of the healthiest edible oils in the world because of its very high proportion of monounsaturated oil (82%). The high oleic acid content in macadamia oil which is even higher than olive oil, makes it important for re-balancing your cholesterol levels and reducing the amount of triglycerides in the blood. Omega-3 and omega-6 fatty acids are the most commonly discussed fats, and ideally, our bodies would have an even balance. Macadamia nut oil offers this balance, making it optimal for the human body as a great source of these fats. Because it is so similar to the natural sebum present in the skin, when macadamia is applied to the skin the oil quickly penetrates the outer layer of skin. It is also highly anti-inflammatory, one of the key reasons that macadamia oil helps to calm and soothe irritated skin. Macadamia oil contains more than 60% oleic acid that is great for softening skin, regenerating skin cells, moisturizing skin, and is a natural anti-inflammatory. Our oil is also unique due to its high content of Palmitoleic acid, a monounsaturated fatty acid that avoids oxidation and fits with the skins fatty acid composition. Palmitoleic acid is found in human sebum among the young, but the level dramatically drops in mature skin. 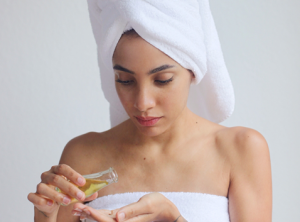 Macadamia oil is among the closest of all botanical oils to human sebaceous oil. 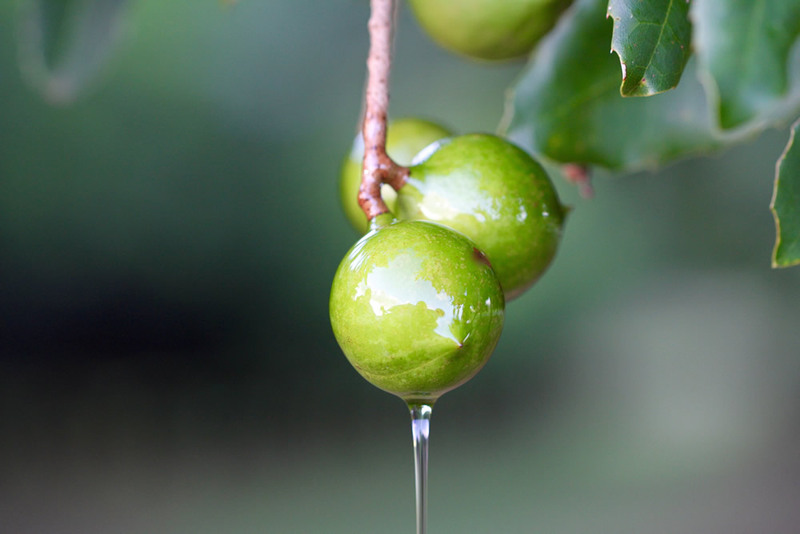 Macadamia nut oils are rich sources of squalene, a naturally occurring antioxidant present in human skin surface lipids that protects us from sun-induced lipid peroxidation. It’s primarily used in our bodies to synthesize both cholesterol and vitamin D, but its role in macadamia nuts is to prevent oxidative damage . Jindilli is one of several words used by Indigenous Australians to describe the macadamia nut. It was chosen as the name of our first property purchased back in 2010. Our 4 farms which consist of both mature plantation and newly planted trees are located both in Northern New South Wales and Southern Queensland. We strongly believe in the use of sustainable and environmentally sensitive farming practices. We are meticulous in the care of our orchards, to ensure the health and productivity of our land for future generations. It takes 5 years after planting before a macadamia tree will product nuts. Production will increase until a tree reaches maturity at approximately 12 years of age. 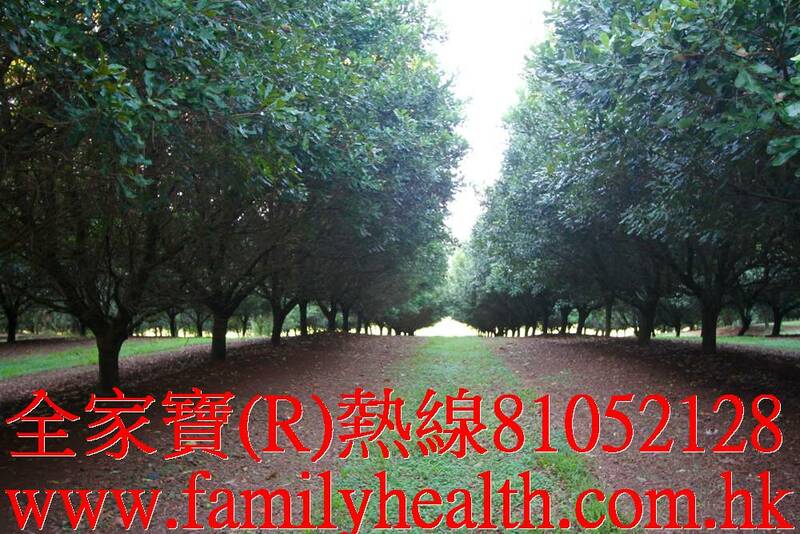 Macadamia trees are grown in rows in an orchard setting. Mature trees grow to heights of between 12 and 15 metres and have shiny dark green leaves. Given enough access to light, good soil and plenty of sunshine and moisture a macadamia tree can live to 100 years old. Flowering occurs in early spring with nuts forming in early summer and, by early autumn, clusters of plump green nuts appear. The nuts grow encased in a hard, woody shell, which is protected by a green-brown fibrous husk. Shell hardening takes place in early December followed by rapid oil accumulation in late December and January. Between March and September, the mature nuts fall to the ground and are harvested every 2-3 weeks by purpose built harvesters. The fibrous outer husk of the macadamia is removed by the harvester and is left in the orchard to act as a mulch. The dehusked nuts are transported to the factory for sorting before they are dried in large silos. At harvest the nuts have a moisture content of up to 22% and the drying process must reduce the moisture content down to 3%. At 3% the nuts can be cracked and the kernel easily removed from the shell. Macadamias are mostly grown in Northern New South Wales and South-Eastern Queensland thanks to their sub-tropical climates. Recently there have also been significant increases in plantings of trees in the Bundaberg region. These locations all have the perfect conditions for growing this native Australian nut. Brookfarm Premium Cold-Pressed Macadamia Oil uses only macadamia nuts harvested from this award-winning family farm on Byron Bay. The farm has over 4,000 macadamia trees as well as eucalyptus trees in a 30-acre sub-tropical rainforest teeming with wildlife. Home to native insects, bees, owls, koala, turtles, water dragons, snakes and birds, the forest eco-system provides a natural balance for sustainable farming. Brookfarm's Premium Cold-Pressed Macadamia Oil has the most stable fatty acid profile, with 84% monounsaturated fats and 13.5% saturated fats, and as little as 2.5% polyunsaturated fats, ensuring it will not easily oxidise under conditions of light and heat. Its high smoke point of 210 degrees Celsius also makes it an excellent choice of cooking with medium to high heat. Macadamia trees are native to Australia. Their nuts and nut oil are rich in Omega 9 and 7 fatty acids, Vitamin B1, magnesium, manganese, phytosterols and antioxidants and are known to help stabilise cholesterols and triglycerides. Natural, premium grade, first cold-pressed macadamia oil. 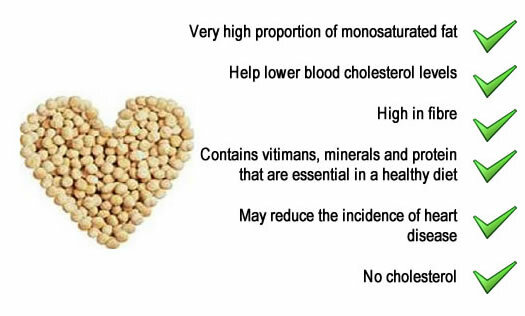 Cholesterol free and the world’s richest source of monounsaturates. The nutty, sweet aroma enhances natural food flavours. 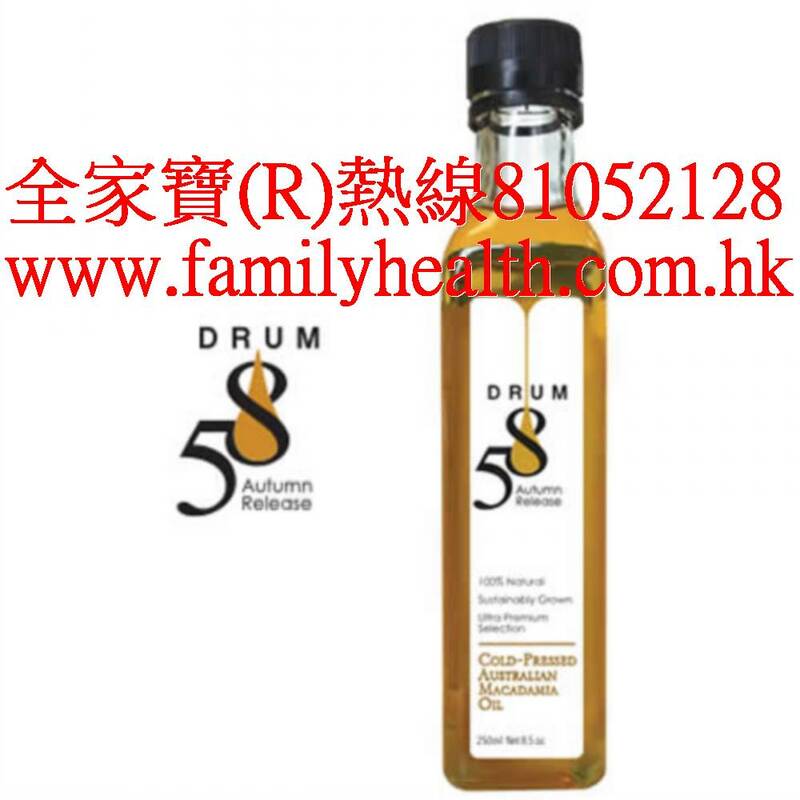 It is an essential ingredient for salad dressings stir-fries, baking and pan frying. This is a golden coloured gourmet oil with the nutty sweet taste of the Australian Macadamia nut. 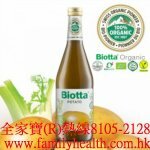 It can be used for salad dressings, marinades and as a table dipping oil. The oil has a high smoke point of 210C/410F and can be used for high temperature cooking such as stir fries, baking etc. It retains its unique flavour throughout cooking and will not burn.